Welcome to the Olympia Trillium Community! Olympia's Trillium community started with a small, eclectic group of friends who had been gathering regularly for a number of years to explore various forms of self-inquiry. In the fall of 2011 some of us discovered what was then called Waking Down in Mutuality, and started reading associated books and essays, and attending sittings with teachers in the region. 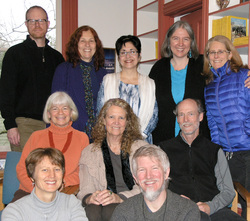 Early in 2012 we started inviting teachers from Portland and Seattle to come to Olympia and hold occasional and very small sittings. By mid-year we also began to meet periodically on our own, as a peer circle, to practice mutuality. By the end of 2012 there were about seven of us and we were meeting roughly once per month either for a teacher-led sitting or a mutuality circle. The work proved to be quite powerful and transformative, and by early 2013 three of us had realized stabilized embodied consciousness awakenings! Inspired, we developed a regular schedule to support our work and brought in the NW teachers to be with us and further catalyze our evolution. We also arranged "Skype sittings" in order to experience teachers outside our region because we found that having a diversity of teachers was deeply enlivening for us. Over time, our identity as a peer circle strengthened as well - we came to value our community independent of a teacher. Over time, our circle doubled in size and we ramped up to two events per month: one teacher-led sitting and one mutuality circle. We also formed a Coordinating Circle to provide structure and support as we navigated our expanding group's needs. In 2014, we began hosting weekend workshops which allowed deeper immersion in the work. These events were well-attended and many participants had wonderfully transformative experiences. By the end of the year several more of us had an awakening, and many others experienced subtle but significant shifts. In 2015 and 2016 we enjoyed continued growth in membership, more wonderful workshops, new leadership stepping forward to support our community, and many more of our practitioners are enjoying stabilized realizations of embodied consciousness! As of September 2017, we have 34 active members in our vibrant mutuality circle community, two of whom are now interning teachers - Joanne Lee and Margit Bantowsky - and one of whom is a mentor - Kirstin Eventyr. We generally have two to three events per month: one monthly sitting, small mutuality circles, intro nights and teacher led workshops. See our Events Page for upcoming offerings. Our mutuality circle community regularly welcomes new members. If you want to learn more about engaging with us, click here. "Through trust, we find we can eventually BE ourselves, all of ourselves, from low to high, simple to complex, in every dimension. "We find we can survive and even transform into delicious divine food our darkest parts. Through trust we express, celebrate, and magnify our Divine and human natures."